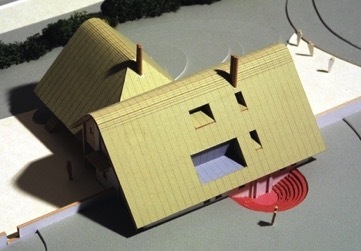 The concern for environmentally sustainable design is a theme running through much of the practice’s work, and this was the first residential project in which such principals were incorporated to a significant degree. The site is truly outstanding, featuring panoramic south westerly views over unspoilt farmland and is set below the chalk ridge of the ancient Woolberry Ring Hill Fort. The proposal was to cut a level platform into the chalk and erect an oak frame structure, topped off with a well insulated copper roof. 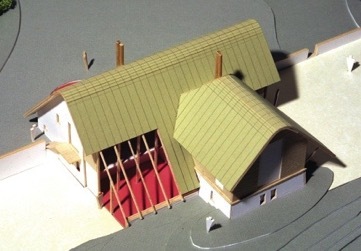 The external walls are to be formed using the excavated chalk from the dig, which is then crushed and packed into formwork to create a traditional cob wall construction. The sun's heat is captured in a solar space and then drawn into a subterranean rock heat store so that warm air can be passed around the house when needed. Rainwater storage and grey water systems will limit demand on the adjacent well. The bottom image shows the first construction phase - a barn for stabling. 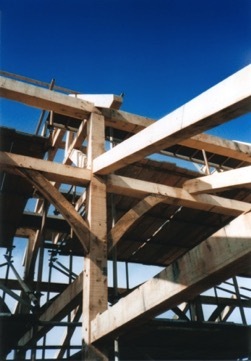 This structure incorporated many of the carpentry techniques and components which were used in the main house.